I had a very interesting telephone call from a reader recently, the gist of which was that, although he found all the advice on barbel from me and others fascinating, all the advanced stuff on fancy baits and advanced rigs was frustrating him because he was still having great difficulty in catching his first barbel, after months of effort. The conversation ended with a plea for me to cover the basics of barbel angling to enable a raw beginner to put a few fish on the bank. I suppose all angling writers are guilty at times of assuming that readers have as much experience as we do, so I have decided, with the editor's indulgence, to cover the basics in three features. It may sound arrogant, but apply the principles outlined, and I guarantee your first barbel. As with all fishing, the most important aspect of success with barbel is location of the fish, because no matter how good you are, you can't catch a fish that isn't there. You must be prepared to devote maximum attention to this most vital task. Early season location will be centred around the spawning beds, where barbel spend much of their time, from May until possibly early July, depending on weather. In a cold spring, the barbel may still be waiting to spawn at the opening of the season, and the gravid females will be in close proximity to the spawning areas. There is often a high concentration of big fish in a fairly confined area, which is useful not only in possibly catching one or two but also in assessing the potential of the stretch. If you are looking at a new section, it is always a good idea to pay visits in late Spring and early Summer, when careful observation can pay tremendous dividends. The fish feed hard in the pre-spawning period, giving excellent opportunities for exceptional sport with big fish, but it doesn't last long. The fish are obviously easy to spot on the gravelly shallows, and therefore soon become spooked. They will then disperse after spawning, back to their normal haunts. It is then our job to find them all over again. Before spawning takes place, however, they will remain close to the shallows, and the nearest available cover will warrant close investigation. 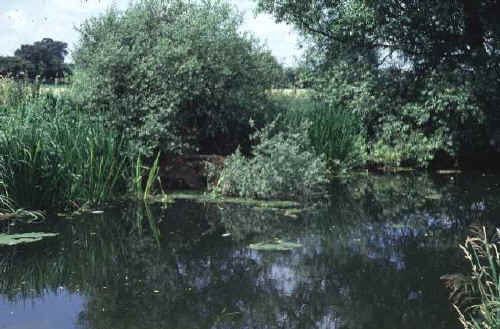 Overhanging bankside foliage, lily or rush beds, or even a section of deeper water, where the bottom cannot be seen, are all reliable holding spots at this time of the year. Particularly useful to know about are areas of sudden depth change, where the barbel will rest up. The best way of finding such features is wading the river, and most of my small river swims have been found this way. If depth permits, I use chest waders, feeling for depth changes in front of me with my landing net pole. If you do adopt this tactic, be mindful of your safety. You don't want to be stepping into any unexpected holes. In early season, do not be discouraged if the only fish you can actually see are small ones. These will usually be the more active males, and their presence will confirm that the big females are nearby. After spawning, the barbel may remain in the area for some time, recovering their strength in the well aerated water. They are then easily spotted, and this gives another golden opportunity to catch one or two, before they disperse. For location of barbel after they have resumed their normal stations in the river, the first thing to realise is that different groups of barbel colonise different stretches of river. An individual group is rarely found in one restricted swim, but more in a short length of river, usually around 100 yards. However, I have known an individual shoal of Ouse fish commute regularly over more than a mile, making it very tricky to keep tabs on them. The individual members of that group may range anywhere in that general area, being found in different spots on different days, possibly taking advantage of variations in localised food supplies, or more commonly these days, responding to angling pressure. Having located a barbel shoal, the actual area from where they can be caught is under your control, determined by swim preparation. 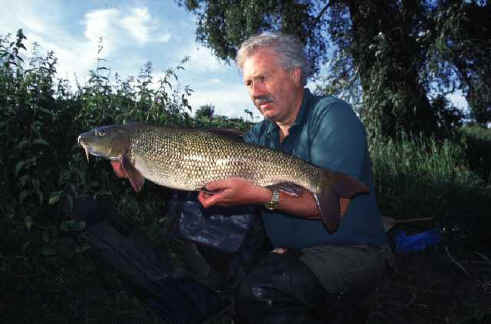 The barbel can be led to a preferred feeding position by judicious use of bait. My approach is to bait one exact rod length out from the bank, over areas of clean gravel that can be plainly observed. This not only permits me to bait and fish with great accuracy, but also observe the fish easily, and assess which swims will be worth the most attention. It also allows me to closely monitor the barbels' behaviour pattern, as it is vital to be able to assess their reaction to the baiting programme. All barbel shoals will spend much of their time when not actually feeding in a selected area that Trefor and I describe as the holding spot. An example of this could be a very substantial depression in a generally shallow stretch, a deep run under a line of bushes, and so on. It is often not feasible or desirable to fish the holding spot because of the geography of the river, and we prefer to create preferred feeding sites close to the holding spot. By not fishing the holding spot the fish are able to commute out of it to feed but be able to rest there undisturbed if they so wish. In our early barbel fishing experiments, actually fishing the holding spots drove the barbel out of the vicinity, as they had no safe haven into which to retire when they came under stress. Common sense, when you think about it. I create a feeding site no more than about fifteen yards away. The further from their holding spot the prebaited area is, the more potentially nervous the barbel will become, and the less certain it will be that they will continually visit it to feed. The whole trick of success with summer barbel is to instil in them the assurance that they can feed unmolested. The nearer to the holding spot the feeding site is located, the easier this will be to achieve. Having located a likely holding spot, a good ploy is to bait the nearest patch of clean gravel that can be clearly observed, provided that it is not too far away. If no clear area exists, then create one, either by cutting away a few tresses of streamer weed, dragging out some cabbages, or thinning an area of rushes, whichever is appropriate. In any weed clearance operation, however, please remember that moderation is important. I earnestly advise against mass weed removal. You only want a clear area large enough to observe the fish and present a hook bait to them. If the fish are asked to feed over a large barren area they will become very nervous, which is obviously counter productive. When you are creating a feeding spot, then, do not fall into the trap of thinking that you should remove every vestige of weed in the vicinity, thinking that will improve your chances of landing the fish. That will jeopardise your chances of hooking one in the first place. The time to worry about landing a hooked barbel is after you have successfully hooked it. Then, you can always go in the river if you have to. After I had taken my 14lb 7oz Ouse fish from under an extensive raft and close to a substantial snag, an angler who fished the swim later thought that he would improve his chances of landing a fish there by removing most of the raft and cutting the snag back. It's true he never lost a fish from that swim. He never hooked one, for the simple reason that they'd all moved house because some prat had taken the roof off! In some weed beds, you will notice natural channels leading through the foliage, and these act as highways for the fish. When such channels are close to a suspected holding spot, it is a simple matter to open one of them out a little to create the feeding site. This is important because not only will you know where the fish will feed, you will also know where the fish first enter the swim when they begin to feed. A bait placed in the natural channel, just on the edge of the created opening, is then almost bound to be intercepted by a barbel as it enters or leaves the swim. When doing this, however, keep in mind the desirability of creating the preferred feeding site at one rod length from the bank, for ease of baiting, observation, and accurate bait placement, specially during the dark hours. The same principle applies if there is very dense weed close to a holding spot. This time, you can create your own channels through the foliage, making the slightly more open feeding site in the position you consider most advantageous. But do not choose the feeding site in a totally haphazard fashion. Plumb the stretch or, better still, wade the river, to see if there are any natural features that will make a good swim into an excellent one. 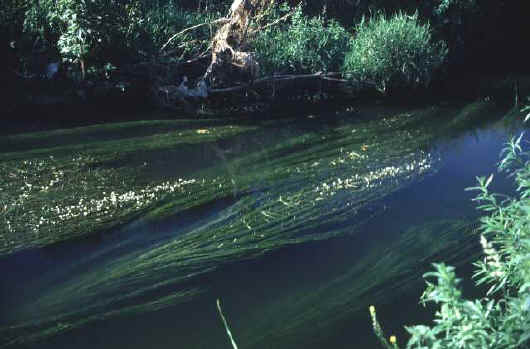 For instance, you may be creating an intended feeding area in a length of dense streamer weed. By wading through the fronds, you may discover a small depression or an area of gently sloping gravel. Such an area would have special attraction for fish even before you begin your baiting programme. As with all aspects of successful big fish angling, spend some time in thinking about what you are doing. On every barbel river I know, top class swims are associated with underwater snags. Many of the biggest fish in a river will often be found in the vicinity of such obstacles, which could be sunken trees, boulders, or even the remains of a car, as Trefor and I found on the Severn many years ago. So far, I have discussed obvious features, but it is a grave mistake, as in winter chubbing, to ignore those areas which are simply smooth flowing, steady glides, where there is sufficient depth that the bottom is difficult to see. Barbel will feed confidently in such glides providing they are not disturbed, specially at night or in dull conditions when light intensity levels are low. Particularly useful areas to find such swims are immediately above or below areas of very shallow broken water, or the smooth flows on the runs out from weirpools. The water surface must be smooth and evenly paced. Constantly fluctuating water that continually boils is useless. My small stream fishing over many seasons has proved how reliable are the channels between beds of bulrushes, and specially the gently flowing water behind such obstacles, if the current is a bit sharper than usual. Even better when such a feature is accompanied by a narrowing in the river. That great angler John Everard once told me that was the first thing he looked for in finding Thames barbel. In high water conditions during the summer, we have the best conditions for barbel fishing. Coloured water sends barbel into a feeding frenzy, and if they can be located, big catches can result. Under these conditions, speed of flow is all important, as is a smooth surface. If the pace is even and the surface smooth, the depth of the water is irrelevant, the barbel being prepared to feed quite happily in as little as 18 inches of water. High water creates new swims. Creases become more pronounced, and raft swims form around draping branches. Provided that the current flow characteristics are suitable, a good raft swim is as reliable a barbel swim as it is for chub. Slacker areas of river behind obstacles such as rush beds also come into their own more as the river rises. Sunken features such as large stones or areas of collapsed bank will often create large boils in the surface a few yards downstream of themselves, and in fact the high water may then have located features of which you were hitherto unaware. In a swim such as this, a bait placed a yard or two above the visible boil will actually place it on the river bed downstream of the obstacle that caused it, where barbel may well be sheltering from the full push of the current. However, avoid the boil itself, no self respecting barbel is going to feed where the water is whirling like the inside of a washing machine. As the current speed increases, the barbel will gradually shift their position in the river, to one of similar flow speed to that which they are accustomed, and they will only move as far as they need to achieve this objective. When you see your favourite swim, therefore, with a much greater speed of flow, try to work out where the nearest smooth water is, of similar flow speed to the usual area, and then fish there. Many thanks to Tony Miles for allowing Barbel Fishing World the use of the above article.